They might have ended up only winning by two points, but the first twenty minutes of the Tigers’ game against Canberra on Sunday afternoon in Canberra represented some of their best attacking football all year. It was a bit of a quiet match to begin with, until a linebreak from Luke Brooks seven minutes in made it clear that the Tigers had more in their arsenal than usual. Robbie Farah followed up with a kick to the left edge, and while it might have been a bit long, and a bit too angled towards the sideline, it still allowed Kevin Naiqama to showcase some dexterity in popping it back in moments before landing into touch, only for Jordan Rapana to clean it up. Still, this was a strong opening for the Tigers, meaning they were in prime position to take advantage of a series of Canberra errors that started with a rare ball handling error nine minutes in from Nick Cotric, who was still acclimatising to the no. 1 jersey in only his fifth game at fullback. From there, Joseph Tapine made a high tackle, Kevin Naiqama took a quick tap, and Joey Leilua was sent off for a professional foul, in arguably the most damaging sin bin for the Raiders across their 2018 season. The Tigers didn’t score immediately, since a slow peel from Josh Hodgson gave them yet another chance to start the tackle count. Once they did, however, a silky string of passes saw the Steeden move through Brooks, Moses Mbye and, finally, Benji Marshall, who lobbed a harbor bridge over the last line of Canberra defence to send Malakai Watene Zelezniak across in the corner. In a year where their attacking has been so problematic, it was by no means assured that the Tigers would make the most of a twelve-man team, so getting a try this early felt like a statement of purpose. Things got better on the fourth tackle of the restart, when Mbye collected a short ball from Matt Eisenhuth and then put in one of the linebreaks of the season, fending off Shannon Boyd, eluding Iosia Soliola, scooting out of a tackle from Josh Papalii and then dummying briefly to deceive Cotric into lunging towards the left, before sailing over beneath the posts. Esan Marsters had converted before the Raiders had even regathered themselves, while the contrast between the Wests Tigers and Canberra fullbacks couldn’t have been starker than at this particular moment. No doubt, this was as much a matter of Canberra defensive inadequacy as the Tigers’ attack – Papalii, in particular, should have been able to muster a much better effort to stop Mbye in his tracks. Nevertheless, it provided the visitors with even more momentum, as they scored once again, a few minutes later, thanks to an error from Boyd. After not getting their hands on the footy for minutes, the big Canberra forward spilled it on the first tackle, setting up the Tigers for yet another bout of possession and field position. All it took, at the other end of the field, was another, more compressed sequence of passes for the visitors to score. Once again, the halves were synicing perfectly, as Benji sent the Steeden out to Brooks, who paused just long enough on the cusp of the ruck to get Sam Williams interested, before popping over a short ball to get Michael Chee Kam across untouched. 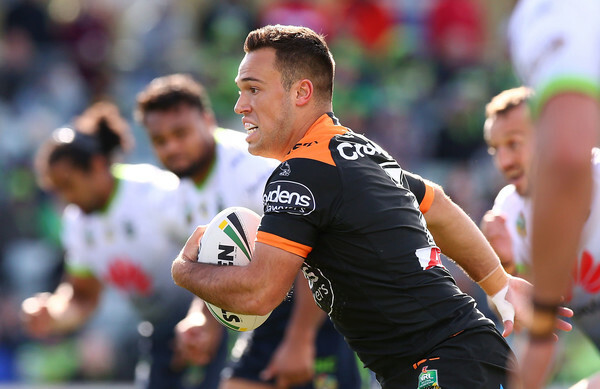 By the time that Leilua trotted back onto the field, the Tigers had scored sixteen points in his absence – Marsters had missed one of the conversions – and so the Raiders needed to start their comeback immediately to regain some control over the game. They got their chance shortly after, as the Tigers seemed to become complacent, leaking a series of mistakes that included a flop from Benji, a handling error from Naiqama and then a second effort from Naiqama. Just as Brooks’ linebreak had ushered in the Tigers’ splendid opening, so a lost ball from Brooks right on the line marked a decline here. On the next set Papalii and Paula almost plunged over as the penalties continued to mount for the Tigers – Benji working on the ground, Taylor holding down – until Tapine built on Paulo and Papalii’s momentum to score the first try of the afternoon for the Raiders. It was a gutsy play from the young second-rower, who stormed at the line from ten metres out, making the most of a slip from Brooks before barnstorming his way over Chee Kam and then busting out of a tackle from Russell Packer to beat Naiqama to the chalk. In fact, Tapine almost expended too much energy to get the footy down at all – he only grounded it with a finger – making the putdown feel even more symbolic, like a vision of the Raiders determined to break their way through the Tigers’ dominance against all the odds, and even if it totally decimated them. For a moment, it looked as if Canberra were about to mirror the Tigers’ brilliance on the restart, making their way up the field rapidly, and appearing to consolidate their momentum with a terrific offload from Cotric about a millisecond before his arm hit the ground. Yet that speed left Soliola behind, who was called offside, giving the visitors the advantage again, for a turnaround of points so rapid that Canberra barely seemed to have regathered their defence when the Tigers scored again a minute later. This time the black and gold army showcased their right edge, as Farah sent the ball through Taylor, Brooks and then Mbye, who made the best cut-out pass of the afternoon so far to put David Nofoaluma across in the corner. By this stage, the Tigers were syncing more superbly in attack than at any other point this year, so it was paramount to the Raiders that Papalii managed to catch the footy at speed and steamroll over Luke Garner to scored beneath the posts three minutes out from the siren, narrowing the scoreline to ten as both teams headed for the sheds. The Tigers started the second half with their last two points of the match, with Marsters booting through a penalty kick after Hodgson was called out for not being square at marker – a pretty lucky call for the visitors given that Chee Kam had played the ball at an angle anyway. They now seemed set to repeat the first half, as Farah dummied and broke through the line on the next set before kicking for Mbye and forcing Brad Abbey to concede a dropout as he frantically cleaned things up in goal. Still, an underwhelming last tackle kick from Brooks at the end of the next set marked a bit of a decline in attack for the Tigers. Shortly after, the Raiders got a bit of luck, as Rapana just managed to save a 40/20 effort from Farah, only for the replay to show that the big winger had actually stepped into touch, albeit right where the shade of the stadium had prevented the referees from discerning the error. By this stage, however, the Raiders were in the midst of a sustained bout of field position, thanks to a linebreak from Tapine and then offside errors from both Naiqama and Farah. The Tigers defence that we’ve seen all year now kicked in, as the black and gold army contained a huge harbor bridge pass on the Raiders’ right edge, and Nofoaluma then caught an Austin kick on the full just outside the try line on the left. Galvanised by that success, the visitors started to reconsolidate, and Brooks started to experiment with some adventurous options up through the ruck, only for Cotric to once again offload on the ground, the move that had almost led to some momentum earlier in the game, before Soliola was unexpectedly called offside. This time, Cotric’s effort paid dividends, setting up a second offload from Silivia Havili, thanks to a pass from Hodgson, and then an early ball from Hogdson out on the right edge to Leilua, who made up for his ten minute absence by scooting around Brooks and scoring a try. A set later, Brooks responded by shutting down Cotric on the first tackle – his best hit-up of the year – but Tapine also got on the outside of Brooks at the end of the set, launching over to the right corner from the middle of the park, for the single best cross-field run of the entire game. As Williams booted through the conversion, the margin narrowed to two – a clutch situation that the Tigers have come to know well over the last couple of years. Yet despite a resurgence of energy from the Raiders, they managed to maintain their lead over the final ten minutes. Combined with their stunning opening stanza, that made for one of their most motivating games of the 2018 season, and a rallying-point for when they take on the Dragons at Leichhardt, while the Raiders will be anxious to bring home a win when they take on the Roosters at GIO.